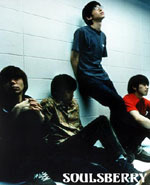 soulsberry formed in January 1998 in Otaru, Hokkaido, a city often called the "Dublin of Japan", but it wasn't until June of that year that the band decided to make a serious go at pursuing a music career. In 1999, STV Radio broadcast soulsberry's music even though the band had yet to record a CD. Indie labels started showing interest in the band, and in March, soulsberry released its first single. The band was even drafted to write a commercial song for the Hokkaido government. soulsberry started touring nationwide in 2000, eventually singing a new record deal with Avex Trax in 2001. The band crossed the Pacific in 2002 to play in the SXSW festival. soulsberry's hook-filled music never sacrifices finese for raw emotional power. The band can rock out while still sounding contemplative.